 Since 1989, Empower Business Solutions has been helping small and midsize businesses select and implement ERP software. Empower is a certified Acumatica Cloud ERP partner and Microsoft Dynamics GP (Great Plains) partner. Focused on helping companies make the jump from basic accounting systems like QuickBooks, or outdated custom-written programs, to a fully integrated cloud-based ERP system. Empower has successfully guided Distribution and Manufacturing companies through the process of implementing the right ERP that meets their specific business requirements and streamlines inventory management. Over the last 30 years, Empower has built a reputation for problem-solving, eliminating barriers to future growth, and facilitating a positive economic impact for customers. Our first goal is to know what’s been holding your business back, the process improvements you need to have, and what the cost of "doing nothing" is. We strive to deliver a positive ROI for our customers and to do that, we need to understand the motivations behind the system change. Gathering this information helps us cater a software demo to your specific needs and processes, and to make thoughtful recommendations as we move forward. Local presence and ongoing proactive relationships. When you’re ready to make a business system change, our team can manage as much of installation and implementation as needed. Because we choose to work primarily with customers inside a three-hour circle of our office, our staff can always make time to meet with customers. We can support you with onsite assistance, troubleshooting, and training. If needed, our development team can make software customizations, or write specific applications that enhance and integrate with the core system. Whatever your requirements are today and in the future, Empower has the people, and the software, that can meet and exceed your expectations.